Giant pandas have captured the collective imagination and fascination of the world for decades. Physiologically, giant pandas are carnivores -- they are made to eat meat -- but they prefer a vegetarian diet. Herbivores are, by definition, anatomically suited to a plant-based diet. The giant panda is no herbivore. He's essentially a vegetarian, a carnivore that eats little meat. Although giant pandas are technically members of the carnivora order, the experts at China's World Wildlife Fund and the Smithsonian Zoo say giant pandas prefer vegetation, especially bamboo. So the giant panda has made a choice to follow a plant-based, vegan diet for most of his nutritional needs. The giant panda lives almost exclusively on bamboo; eating an average of 40 pounds of bamboo shoots, stalks and leaves every day. They also eat a variety of grasses and, on occasion, small prey such as rodents or one of several species of musk deer, a small deer without antlers found in parts of Asia. They have been observed eating carrion as well. Fish and insects are also on the menu for wild giant pandas. In addition to bamboo, giant pandas in captivity around the world eat a diet of sugar cane and a type of rice porridge as well as high-fiber, vitamin-laced biscuits. They also get apples, sweet potatoes and carrots, among other fruits and vegetables, from time to time. Their diet is further supplemented with milk, eggs and ground meat. Since bamboo is almost 90 percent water, especially as young shoots, the panda's water needs are mostly met by consumption of bamboo. Potable water, of course, is nonetheless provided for captive pandas. Wild pandas find water in snow and waterways in their mountainous, wet habitat. The giant panda's body makes it an efficient connoisseur of bamboo. Giant pandas learn to climb trees at about 6 months of age to forage, nest and avoid predators. They can eat 40 species of bamboo, though they usually stick to about 10 varieties. Eating a mostly plant-based diet despite having a carnivore's digestive system requires they eat more to make up for the wasteful nature of a digestive system more suited to processing meat than vegetation. They forage for about 14 hours a day and sleep pretty much the rest of the time. Cubs spend several hours playing as well as sleeping and eating. 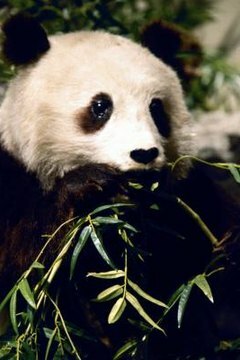 Pandas have strong paws equipped with a kind of opposable thumbs that allow them to hold the bamboo stalk while eating. They eat sitting up like a human or lying on their backs like an otter. The giant panda is critically endangered, according to the World Conservation Union's Red List of Threatened Species. Only about a thousand remain in the wild and a hundred or so in captivity in zoos. The main reason for their status as endangered is habitat loss. As bamboo is depleted, pandas must migrate to new bamboo forests to find food. But as deforestation takes place all over China, there are no new forests to which they can turn for sustenance. Poachers and trappers are to blame, too. The Chinese government is taking steps to protect the giant panda, slowly helping with the recovery of this one-of-a-kind bear with the black-and-white coat and charming face. What Is a Hippo's Diet? What Animal Family Is the Giant Panda From?